We discussed on why increasingly more Chinese tech companies test the water of overseas markets. In 2013, they must feel more encouraging as there were several more successful cases. Sungy Mobile, an Android launcher and app developer with 70% users from overseas, went public on the NASDAQ. Another Chinese company that launched IPO in the US in 2013, online retailer LightIntheBox, has a majority of orders from outside China. IGG, an online gaming company that went public in Hong Kong, isn’t known as a Chinese company in many markets. Keyboard app TouchPal announced 100 million users, most being overseas. 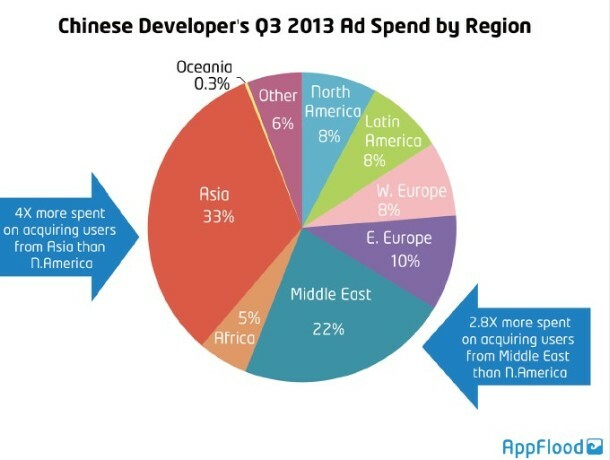 Chinese mobile app developers spent 151% more with AppFlood, a global mobile advertising network, in the March – September 2013 period. In September, Chinese developers for the first time spent more on AppFlood than their peers in the U.S. — It must have something to do with the fact that AppFlood is founded by Chinese. But you can see from the image below that the spend by Chinese developers soared in the second half of 2013. For Chinese developers, joining a platform like AppFlood is for users overseas. It’s no wonder only 0.6% of the total ad spend was for acquiring domestic users in the third quarter of 2013. One third of the total was for Asian users and 22% for Middle East market in the quarter. Asian countries have always been their first overseas markets whenever Chinese companies consider expanding outside China. One reason is that Asian users, to some extent, share the same Internet culture, especially when it comes to online gaming or social. 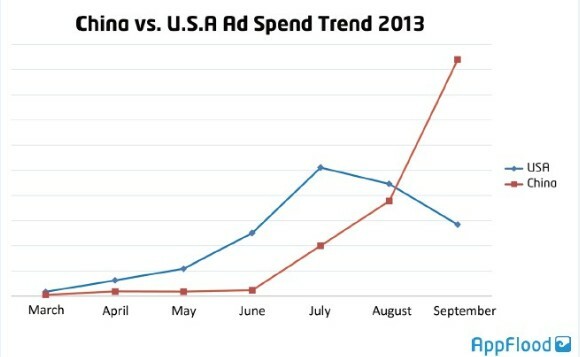 Another reason, according to AppFlood, is traffic acquisition costs for Asian users are lower. AppFlood isn’t alone as a mobile advertising service helping Chinese apps expand overseas. Dianjoy is another that decided to shift its focus to overseas markets as Li Wei, CEO of the company, believes 2013 is the year that Chinese apps really took off in overseas markets. Both the Dianjoy and AppFlood found that their big clients in the year were big Chinese Internet companies. It is believed WeChat, who announced 100 million overseas users, has spent a lot money on marketing in Southeast countries. For small developers, their revenues from overseas are not big at all and wouldn’t spend much with mobile advertising services. Besides mobile app market, the emerging sectors like hardware are comparatively easy for Chinese entrepreneurs when it comes to expanding to or start from overseas markets. Chinese makers place their gadgets onto platforms like Kickstarter to get early adopters and some funding. To ride the hardware trend, some companies are founded to help Western makers from purchasing electronic components to building prototypes, as both the component and labor costs in China are still low. Another category of Chinese tech companies expanding overseas are those who are well established in China that want to export products or experiences. Yodo1 has made success in culturalizing and operating online games from Western companies in China. The company raised a new round of funding in 2013 planning to bring the experience to Korea and Japan. Some tech markets like Japan have long been seen as a closed garden that outsiders could hardly conquer. Henry Fong, CEO of Yodo1, thinks that Western games are not successful in those markets is because they are far from having done well on localization. Although WeChat claimed a large number of registered users outside of China, active users and future monetization are in doubt. It is estimated the potential in apps like Sungy Mobile’s Go Launcher is future monetization through proven Chinese approaches like gaming. But it’s unknown so far whether non-Chinese users would buy those that have been widely accepted by Chinese.